You dare to judge me? I say this with humility. How dare you judge me? Are you living in your reality? Allow me to enlighten you as to why you judge. If you knew why you do what you do, perhaps you would change your course, because destruction is sure to ensue. You think you are riding a high horse, but it is really a pony. In your delusional mind you are on a platform, but the real form is a dark ditch— in which you are encased and bound. The elements that rule your dark world are; resentment, jealousy, anger, stubbornness and pride. Your spirit of pride is where you hide. Hiding from pain you did not reconcile. Since you did not reconcile that pain, you became angry. You think you are angry at the object of your pain. No. You are really angry at yourself. Angry, because you allowed someone you loved, close enough to damage your emotional system. You let your guard down. And now that same guard is protecting your heart from any further injury. That guard is your pride. You are using pride to hide. You dare to judge me? Being under tight security in guarding your heart, you are miserable, because in your mind, you cannot authentically be what you once were. Perhaps, there was a time when you were free to love, happy even, but what was— is no more. Believing this gnaws at your core, because you can never really love again— or so you erroneously think. You want me to be as unhappy as you, because, “Misery loves…” (you know who). Being in the company of misery validates the decision you have made to be a downgrade of what you were. As ruler in your miserable world (the ditch), you take utmost pride in judging and being a naysayer. Saying no is the way to go— rather than you just letting go: letting go of the pain. Your delusional power is in judging me. Making me feel exposed to your cynicism is your way of giving back the pain that has been given to you. You pretend to be for me. You come in many forms: family, partner, friend, lover, colleague, whoever and whatever. Your revenge is to cut me down and make me feel the pain that you feel. You are weak and frail. Weak, to not go and get your power back and too frail to admit you have been derailed. Do not resent me because you are bent on relegating to being absent. Absent from life, love and the birthright of happiness. I am a constant reminder of what you choose not to be. Me, living life, regardless of the mistakes, and the tough breaks, I am still living life despite and in spite of. Watch your resentment, because it evolves into jealousy. Why resort to jealousy when you have the ability— the ability not to beat me, but to join me in life. Most likely, you will not make the change, because stubbornness has full reign. Having delusions that you are so right, when you are sincerely wrong. Thinking you are right— when you are working with all of your might, to fight and remain in your unnecessary plight. As you judge me— judge yourself. But then, that may be asking too much because you really do not like you— do you? I will analyze you, but refuse to judge you, because I feel true empathy and sorrow for you. This entry was posted in Dedication to Meditation and tagged dare, delusional, empathy, heart, judge, life, love, naysayer, plight, regret, stubborness. Bookmark the permalink. 3 Responses to You Dare Judge Me? Wow! What an array of passion you have eluded in todays postings! I feel this is such a prominent absorbent piece of infomation, we should all recognize and identify. When one judges, they put themselves in a self-righteous position. They want what you have. They want to be like you. However, we are all uniquely made. Cease the hate on me. Learn to love yourself. Become transformed and be made or become different in your nature or form. Natalie, once again I, as an avid,dedicated and partisan reader of your weekly blogs, have thoroughly enjoyed today’s postings! Is Judging and analizing your situation the same? I may have some deep feelings of not being hurt again. I refuse to not go through them again. You on the other hand continue to go down that same road I’ve been down no matter what. I can stop it now or, how long does it take to get across to you I’m not going to take it any longer. I’m confuse on what I should do next. I don’t want to take my past pain out on you but you seem to keep walking that path. To me you just like that other person I use to have back in the day. Yeah, I have a problem and the problem is you if you want to make this a good relationship change paths. I can’t forget what was done to me and if I see it happening again and let you know that’s the wrong tree. Then we should stair climb instead of a tree. That’s where my judging comes in, not that you are exactly like the other person but you sho have some characteristics. There is a difference between judging and analyzing. 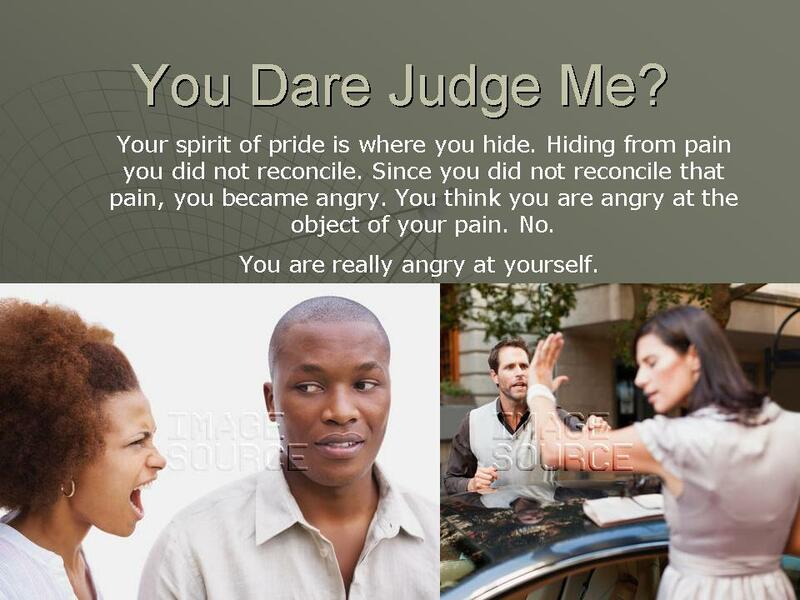 When someone judges, the conclusion comes from an emotional perspective, often times more driven from past experiences making parallels to the current experience, versus the person it is judging. An analysis is more of an objective logical thought process that is void of emotional attachment. Judging each other should never be a part of the relationship. The residue of pain is always the pre-set that dwells in the current relationship in your life. Meaning, you never get past the past. Your heart and mind have created a pre-set of what was versus seeing objectively of what is. Any familiarity (which is bound to happen, as often times we travel in the same personality types of partners) stirs up the pain which has never been resolved or more importantly, a necessary forgiveness of a past love that was never given. When we do not reconcile past pain, we always take the past out on the current love in our life: which is why we need to purge through reconciliation and total forgiveness. I love the suggestion of stair climbing— which provide another option of going the same way, just on a different route.